To me, Adobe has always been the company that made powerful software with hard-to-learn and hard-to-use interfaces. Case in point: Photoshop. This widely used digital photo editing, printing, and drawing software seems to contain every image editing and processing technique known to man, but requires formal training or years of use before it becomes natural. Adobe launched its Creative Cloud in 2012, to mixed reviews. Some people thought a monthly subscription model was a huge improvement over having to upgrade thousands of dollars' worth of software on an annual or biannual basis; others resented having to pay continuously for software that they felt they’d bought, but knew would become obsolete as they upgraded their operating systems and hardware. I initially resented the push to the subscription model, but came around as I realized that my Creative Cloud subscription gave me more of the programs I needed for less total expenditure over time. Initially, there wasn’t much actual “cloud” in the Creative Cloud. It was more of a branding and purchase model change. Eventually, cloud file sharing and exchange and cloud assets became important parts of the Creative Cloud software suite. 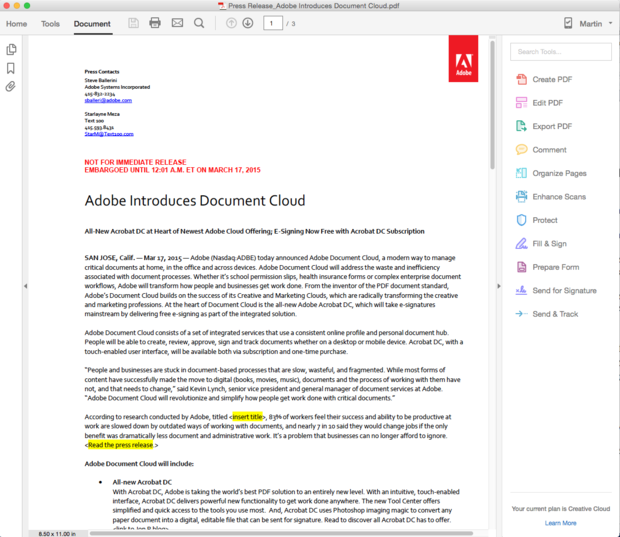 This week Adobe introduced the Adobe Document Cloud along with a more capable, easier-to-use version of Acrobat called Acrobat DC. The combination allows you to create, edit, sign, share, and track PDFs from anywhere, with Adobe’s promise that it will change how you work with all your important documents forever. I won’t go that far -- but it is a big improvement over Acrobat XI. The new Acrobat DC home screen (Figure 1) shows you all the PDF files you have recently visited on all your signed-in computers, including your iOS and Android mobile devices as well as your Windows and OS X computers. This gives you a fast place to start working on PDF files -- it’s actually more convenient than the way Microsoft handles the opening screen of Office applications. Figure 1. Acrobat Pro desktop home screen (Mac OS X) with a signed-in subscription, and Mobile Link turned on. Note that many recent PDF documents have been prepopulated on this screen. Once you open a document, you can see the most common tools in the right-hand column, with the option to search for any tools you wish from the box in the top right (Figure 2). That right there is a huge improvement over the UI of Acrobat XI, where I constantly had to play “find the function” to locate little-used but important capabilities such as redaction of sensitive or personal information. A third major screen, Tools, shows you all major tool categories in graphical form and includes its own search function. We’re still batting 1.000. But here’s where it starts to fall apart. You can save a file to your computer, your Document Cloud (if you’re signed in), or your Creative Cloud (if you have one), but if you go to open a file using the File/Open dialog or look at it from your Mac Finder or Windows Explorer, the Document Cloud is nowhere to be found. At first glance, you might think your file went into a roach motel and will never come out. It’s still there, however. Remember the Home screen? Whew! 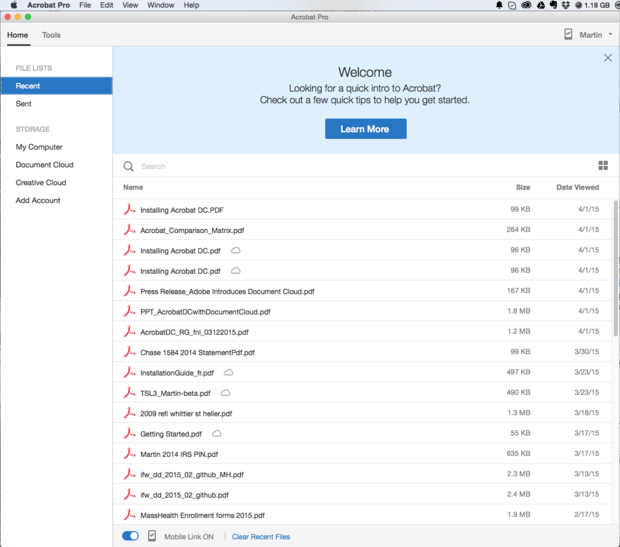 You’ll also find it if you browse to Acrobat.com (the old name for the Document Cloud), log in, and view your files, for example at https://cloud.acrobat.com/recent. Figure 2. Once you open a document, you can see the most common tools on the right-hand column, with the option to search for any tools you wish from the box in the top right. Editing a PDF file used to be limited by the capabilities of Acrobat XI. To work around those limitations, I often made my edits to an article or book chapter in comments so that the author could apply them in Word if accepted, or I asked the author for the original Word document so that I could make tracked edits that they could then accept or reject. Acrobat DC fixes most of that. You can reflow text not only across a paragraph, but also across a page. You can add new lines to existing bulleted or numbered lists without reformatting. And fonts are matched -- sort of -- automatically. Sort of matched? For example, in Figure 3 you can see Acrobat DC trying to match a document’s fonts when I’m editing. This PDF uses Gill Sans, which is present on my Mac but not on a fresh Windows 10 installation. On the Mac, I had no problem editing; on Windows, Acrobat decided to substitute Comic Sans. At first I thought that was a joke. Alas, no. Should you happen to have touch-enabled devices, Acrobat DC will work with them. If you need to start with a scanned paper document, Acrobat DC will make quick work of converting it into an editable document, matching the fonts as well as it can, creating blocks, and giving you an opportunity to easily correct any OCR errors. If you need to export to Office, Acrobat DC does so much more cleanly and with better fidelity than Acrobat XI ever did. Figure 3. Acrobat DC tries to match the document’s fonts when editing. This PDF uses Gill Sans, which is present on my Mac but not on a fresh Windows 10 installation. On the Mac, I had no problem editing; on Windows, Acrobat decided to substitute Comic Sans. Umm, OK. The concept of hand-off between iOS and OS X seemed interesting last year when Apple introduced it, but I never saw it in action because my iPad and iMac are too old. The Acrobat DC mobile versions on iOS and Android can interact with PDF content almost as well as the desktop versions on OS X and Windows, and the Document Cloud with mobile sign-in makes hand-off a low-friction process. Yes, you workaholic, you can mark up a PDF from your iPad on the train to work, then pick up where you left off from your work computer (Figure 4). If you think about it, camera integration might be the most useful integration that mobile Acrobat could have -- and it does. 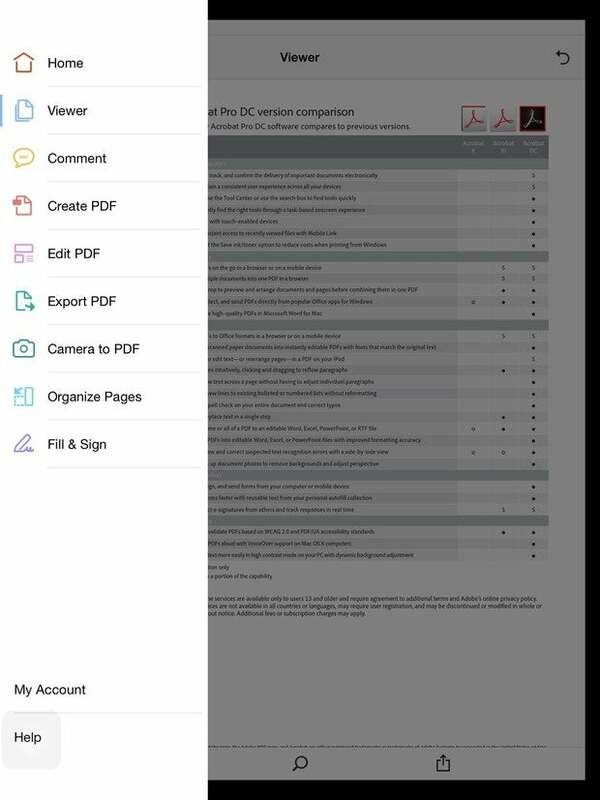 Use the Camera to PDF function in mobile Acrobat DC, and you can take a new picture or pick an image from your device, then track the conversion on the Acrobat Outbox. Once it’s converted and in the Document Cloud, you can enhance the PDF on a computer. The enhancements aren’t always perfect, but if you weren’t too far off on the angle and exposure of your images, you can correct them within Acrobat DC, fix the skew, and have it recognize the text. Does this replace a scanner? No -- but it’ll do in a pinch. Figure 4. The free iOS and Android versions of Acrobat DC can handle many of the most important PDF manipulation tasks, in addition to a few very useful mobile integrations. While form filling and electronic signatures have been useful for PDFs for more than a year, Acrobat DC and the Fill & Sign apps have taken this to a new level. In addition, Document Cloud adds tracked sending and delivery of documents, even large files that won’t transmit over email. Tracked sending requires a subscription. If you don’t have a paid Document Cloud subscription, you can still send large documents, but what you’re sending are anonymous links. This might be another argument in favor of a subscription -- or it might cause users who have purchased the product to raise a ruckus, the way they did when Photoshop CC became subscription-only. Overall, I like Acrobat DC’s greatly improved mobile and touch functionality, its better desktop usability, its much better PDF document editability and fidelity (even for scanned documents), and its new cloud sharing, signing, and tracking, as well as the fact that Acrobat DC is already included in my Creative Cloud subscription. I’m less enticed by the few omissions in the new user interface, the fact that Acrobat pricing is still at a premium level, and the limit of two desktop/laptop installations per subscription, which became an issue for me during my review. All of these are reflected in my scores: I consider Acrobat DC to be very good, but not yet excellent. Nonetheless, I’ll bet many of you use more than two computers. I might guess you use one at home, one at work, and a laptop for the train and other travel. Does the tablet support in Acrobat DC make a difference? I would guess yes -- but I’d also offer the observations that the sort of people who use Acrobat heavily are also touch typists who are most productive when they have a physical keyboard, and the Bluetooth keyboards for tablets are not yet up to the same level as the keyboards on good laptops.